Why Sunglasses? An accessory that serves the twin purpose of shielding you from the scorching heat of the sun, its damaging ultraviolet rays along with beautifying your appearance, a pair of ‘sunglasses', is the first choice of the young as well as the old today. Few years from now, the charisma of sunglasses was not that widespread. Sunglasses were confined to beach, golf course or the car. But today sunshades have become an indispensable fashion accessory. To wear sunglasses that complement your attire and adorn your looks has become ‘must' to complete your dressing. Sunglasses are not all about glamour and a means to look trendy. These glasses duly serve the purpose they were invented for i.e. protecting an individual's eyes from the most harmful ultraviolet rays of the sun, dust particles and other micro-organisms roaming around freely in air and are therefore a real aid in visual comfort and clarity. Sunshades are immensely important for those who suffer from a visual impairment. For instance people who are myopic, who can neither undergo a surgery due to financial constraints nor can adapt themselves to wearing contact lenses, wear sunglasses for it lends an absolutely different vision to them. Every time they move out with their sun spectacles, they can see things in a changed manner. Sunglasses are an ideal source to conceal an individual's emotions as well as the dark circles under his/ her eyes. Unlike normal specs, sunglasses are thick and dark. So acting as a veil, these glasses do not allow other people to a person's eyes. Besides the blind people and patients of conjunctivitis wear smoked spectacles to not to parade the problem with their eyes. There are several parameters to decide upon a pair of glares. From color of the lenses to the brand and price tag attached to that pair of sunglasses, there are quite a few things to be considered. The choice of kind and color of lens varies from person to person. Lens used in sunglasses can be of plastic or glass. But glass lens is preferred for its best optical clarity and scratch resistance. For the fashion devotees, usually the lens color varies with their outfits. They are ready to buy any color that suits their tastes and add to their style. But people, who have a practical purpose behind wearing sunglasses, often work on the advice of their doctors. However every color in lens has its own significance. For instance the green, brown and grey colored lenses are used to minimize color distortion. Due to contrast enhancement and depth perception properties, yellow lenses are worn at the time of playing golf and such games. Like the lenses, frames too come in different shapes, colors and sizes. Frames are commonly made of plastic, nylon, metal or metal alloy. Each kind of frame has its own characteristic features, which makes it useful for different occasions. On the basis of the purpose the frame serves i.e. of holding the lens, there are three kinds of frames, full frame, half frame and frameless. The worth and temptation of sunshades depends on the popularity of its brand and the designer and celebrity associated with it. For instance Gucci, Versace, Oakley, Fendi, Matrix and Terminator, are some of the timeless hot-picks whereas the celebrity spekkies like Britney Spears, Jerry Garcia, Thalia etc. are definite pulls across the world. Most often the designer whose clothes people wear or the glam world icon they adore, is the one whose sunshades they prefer to buy. 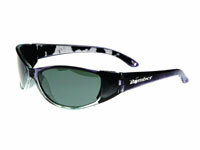 However, these world-class brands in sunglasses are high-priced which restrains many aspirants from purchasing them.